A winter chill has arrived in the desert. The desert is now experiencing moderate to severe ice with daytime highs near or below 60 F degrees. It is expected that this trend will continue through New Year’s. This will drastically reduce production availability through this period, if not through the balance of the desert season. Once again, this year’s winter deal is shaping up into a roller coaster of supply. The early production window experienced a significant industry oversupply as ideal growing conditions in the Sonoran Desert Valleys pulled production forward into early harvests of most commodities. Market values dropped to rock bottom levels and outright field walk-by’s. Now, the reduced remaining balance of available winter acres are facing the winter chill. As is typical, Cauliflower and Broccoli are the first to be affected. Harvests and harvest estimates are now significantly under budgeted levels. And, the repercussions of premature harvest are likely to result in major shortages through the remainder of the desert season. While Lettuce and Leafy Green supplies currently remain abundant, we expect to see weather and disease related industry supply declines in both January and February. With volatility in prices and supplies across all commodities an inevitability, active communication and collaboration between grower/shippers and customers are the keys to successfully managing consumer expectations. Tanimura & Antle uses environmentally friendly techniques to keep birds away from their fields. Tanimura & Antle takes all areas of food safety into consideration during the growing process. Although birds are not known to cause significant damage and contamination to our crops, we use a variety of environmentally friendly and non-lethal methods to keep birds away from our fields. These methods include solar powered high frequency noise devices, installing owl houses, and the use of falcons to keep smaller birds away. 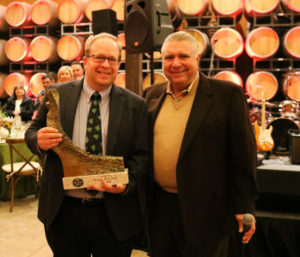 Tanimura & Antle awarded its Chief Ag Officer, Steve Bassi with the inaugural Demeter Award on Friday, December 8th for his commitment to the well-being of Tanimura & Antle and its employees, growers, customers and vendors, his unfaltering loyalty, dedication and mentorship for the betterment of all. In conjunction with launching its employee stock ownership plan (ESOP) earlier this year, and the celebration of its 35th anniversary this past November, the Demeter Award for Agricultural Excellence and Leadership is meant to be “celebratory, everlasting and self-renewing,” said Rick Antle, CEO of Tanimura & Antle. The everlasting bronze statute depicts Demeter, the Goddess of Agriculture, “with her arms outstretched to the heavens, symbolizing the circular shape of the world; the continuous cycle of the seasons and the shape of a plow. A closer view of the statute shows a plow tilling uncultivated earth and as the soil passes along its blade it changes from barren soil to that with roots and then plants and finally fruit, the life of a plant,” explained Mr. Antle in his speech. “Our award winner is best described as having ‘The Mind of a Scientist and the Soul of a Farmer’,” said Mr. Antle of Steve Bassi. Employed by Tanimura & Antle for the past 31 years, Steve has played multiple roles within the company and has become the go-to guy for what is happening on the farm. “It is truly a great honor,” said Mr. Bassi. “I am extremely proud of the company accomplishments, team, grower and farmland base that has been built over the years,” he said in his acceptance speech. “I now know what my true purpose is: To provide continuing leadership and pass along all the philosophy, advise, guidance, lessons and mentoring that I was fortunate enough to receive from yourself (Rick Antle), Bob (Antle) & George (Tanimura) as well as the Tanimura brothers.